(Nanowerk Spotlight) At the core of research efforts to determine the impact of synthetic nanoparticles on the environment and living systems is a fundamental understanding of the interactions between man-made nanoparticles and natural living systems that have evolved over millions of years. Environmental toxicologists, chemists and social scientists have argued that rapidly growing production of nanomaterials will inevitably lead to an increase of engineered nanoparticles in the environment via air, water and soil (see ""Nanoecotoxicology: Nanoparticles at large"). To describe nanoparticles at large, Pu-Chun Ke, Associate Professor of Physics at Clemson University, says that it may be beneficial to acknowledge that 1) biological systems are part of the food chain and therefore an essential component of the ecosystems (i.e., the behavior of nanoparticles in biological systems and that in the environment are intertwined and often correlated); and 2) collaborations are essential for such interdisciplinary research. – the knowledge of biophysics and physical chemistry underlines the energetics, assembly, and interaction between nanoparticles and solvent molecules, biomolecules, organelles, cells, and organisms, which are complementary to the information offered by molecular cell biology, microbiology, plant science, toxicology, immunology, physiology, and genetics." Ke adds that fields such as soil science, horticulture, as well as environmental science and engineering, are just some of the disciplines that are relevant for examining nanoparticles at large. In an Advance Article in Physical Chemistry Chemical Physics ("A biophysical perspective of understanding nanoparticles at large"), Ke and his coauthor Monica H. Lamm, an Associate Professor at Iowa State University, present a biophysical perspective that describes the fate of nanoparticles in both the aqueous phase and in living systems. Rather than yet another review of the field, this article attempts to provide a reflection as well as a perspective on the biophysical inner workings which may impact and govern the behaviors of nanoparticles at large. "Since 2003, my lab and my collaborators have engaged in using biophysical techniques – spectrophotometry, fluorescence microscopy and spectroscopy, electron microscopy, and molecular dynamics simulations – to investigate the complex phenomena associated with nanoparticles in the aqueous phase and in living systems," Ke tells Nanowerk. "The goal of such research was to understand the implications of engineered nanoparticles in biological and ecosystems at the molecular, cellular, and whole organism levels, in order to enable the safe and full applications of nanotechnologies." Ke says that the integration of biophysics – using the methods of physical science to study biological systems – into the investigation of nanoparticles at large is natural considering that the advancement of nanotechnology has historically been associated with the physical properties of nanomaterials, and that biophysics is an interdisciplinary science addressing biological problems with a physical thinking. 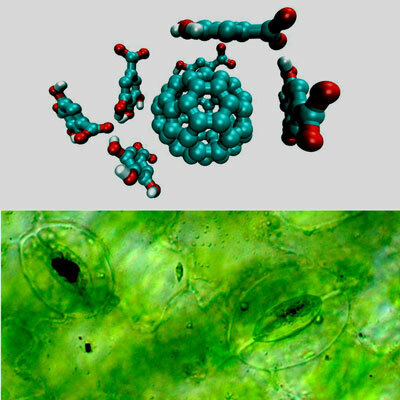 In previous Nanowerk Spotlights we already covered Ke's work extensively, for instance in describing the challenge of designing nanomaterials with reduced toxicity or the exploration of nanotechnology's impact on major food crops. – to project the important scientific questions in this field, which may be addressed using biophysics and physical chemistry. There are many opportunities for experimental and computational biophysics at the interfaces of engineered nanoparticles and natural systems. (Reprinted with permission from RSC Publishing). To do that, Ke and Lamm present the biophysics in describing an array of nanoparticles, namely, fullerenes and their derivatives, carbon nanotubes, quantum dots, dendrimers, and plastic in the aqueous phase and their interactions with biological and ecosystems. Specifically, they show the remarkable capacity of natural organic matter in modifying the surface properties of fullerenes and affording these hydrophobic nanoparticles water solubility, mobility, and bioavailability. "Since the fate of nanoparticles is essentially a convolution of the physicochemistry of the nanoparticles and the perturbed host systems, we provide a parallel study on the uptake and translocation of fullerene derivatives across plant and mammalian cells," Ke explains the thrust of the paper. "To illustrate the responses of plant systems to nanoparticle exposure we show the generational transfer of fullerene through the rice plant progeny, as well as the effects of quantum dots and plastic adsorption on algal photosynthesis." In the conclusion section of their article, Ke and Lamm highlight a number of questions regarding the interactions between nanoparticles and their host systems. "Some of these questions may take time to address due to the limitations imposed by instrument resolution or computational cost" says Ke. "We anticipate the emergence of bionanophysics and increased contributions by researchers in the fields of experimental and theoretical biophysics, polymer science, and computer simulations."